Seto Handicraft Association organized a grand exhibition in Pskov, RUSSIA. There are handicraft items from 17 different masters at the display in their National Heritage Center. Besides mittens and gloves, there are belts and embroidery, silverware and woven works presented in this glamorous and extensive show of Seto Culture. Nordic Knitters brought 30 pairs of mittens and gloves. Also a beautiful slide show is running next to the actual knitwear. Most of the mittens are knitted using Siberian seto floral patterns. The rest are ancient patterns from Setoland and Estonia. The exhibition will stay open until March 23rd. 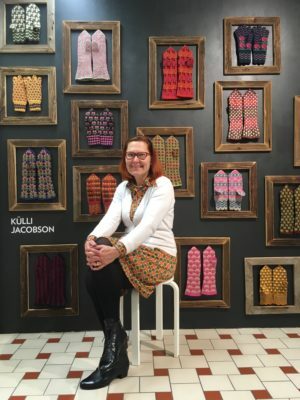 Nordic Knitters were chosen as one of the four partners in “Knitted Friendship” – an Estonian-Finnish textile artists first show. The show will be repeated in Tallinn, Estonia next spring. Beautiful ancient mitten patterns were accompanied with Siberian Seto floral motifs. There were mittens, gloves and extra long cuff mittens displayed. The exhibition stayed open for four weeks. On one of the weekends, there were also workshops and pop-up shop. It drew a lot of crowd and the whole event was warmely welcomed. Thank you, Estonian Folk Art and Craft Union and Finnish TAITO organization for this pleasant opportunity!